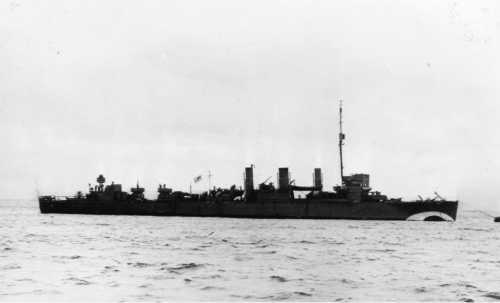 Ludlow as seen during the war, note the false bow wave. IWM photograph with thanks to Jan Visser. History: Built as USS Stockton of the Caldwell-class, commissioned in US Navy on 26 Nov, 1917 and decommissioned on 26 Jun, 1922. Recommissioned on 16 Aug, 1940 and transferred to Royal Navy on 23 Oct, 1940. Beached off Fidra Island, Firth of Forth on 15 July 1945 to be used as a rocket target by the RAF. Now lies off Yellowcraigs beach in 6m of water, broken up but stern still intact.